Turn a $30 light therapy mask for anti-acne or anti-aging into a $300 light therapy mask with this tutorial! 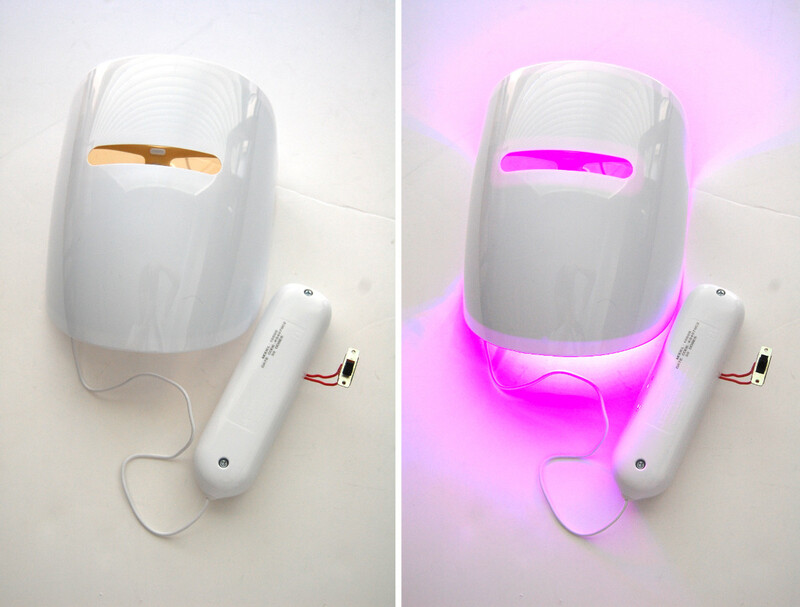 The Illumask is the most affordable light therapy unit. But its cheap price tag comes with a cost; the unit is limited to only 30 uses. But, don't worry. Here's how to get thousands of uses from one mask. Save money and the environment! 1. Remove batteries by unscrewing the plastic back off. 2. Unscrew the battery holder screws and move the battery holder to the side so the circuit board is exposed. Be careful to not rip out any of the delicate wiring. 3. Solder to wires to your switch for the on position. 4. Solder the other ends to the silver mound that the small wire is coming out of (LED), and the other to the silver contact labeled GND. 5. Replace battery holder and put batteries back in. 6. Test it. If done correctly, your switch bypasses your counter and should turn on and off based on the position of the switch. Now your Illumask can be used for a lifetime! 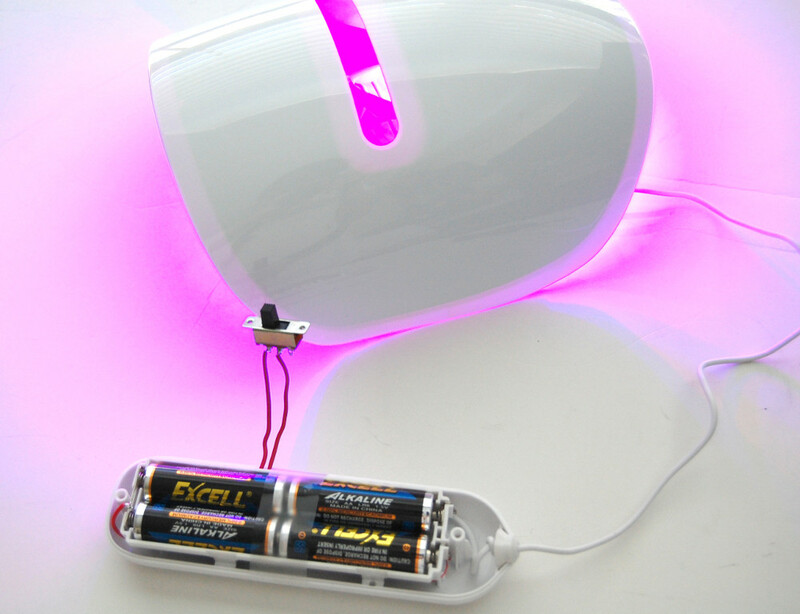 The LEDs (lights) in the Illumask have an average of 100,000 hours of lifetime. That is 400,000 15 minute sessions from one mask! The only thing you'll need to do is replace the batteries when the lights start to dim. The only negative with this switch is that it will not automatically turn off after 15 minutes. Simply set a timer on your phone and manually turn it off. The plastic back does not need to be put back on in order for the mask to work. To prevent the batteries from falling out, it can be taped down like above. For a more polished look, make a small opening with clippers for your switch and put the case back on. 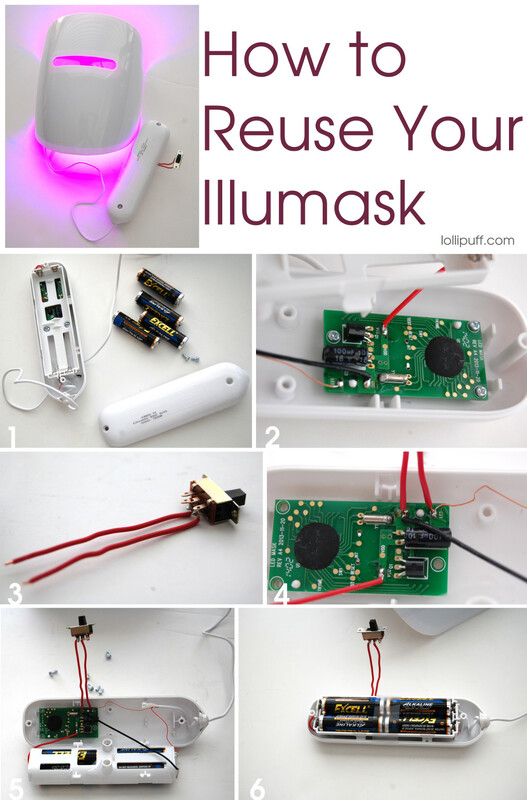 My renovated Illumask is no longer limited to only 30 uses! 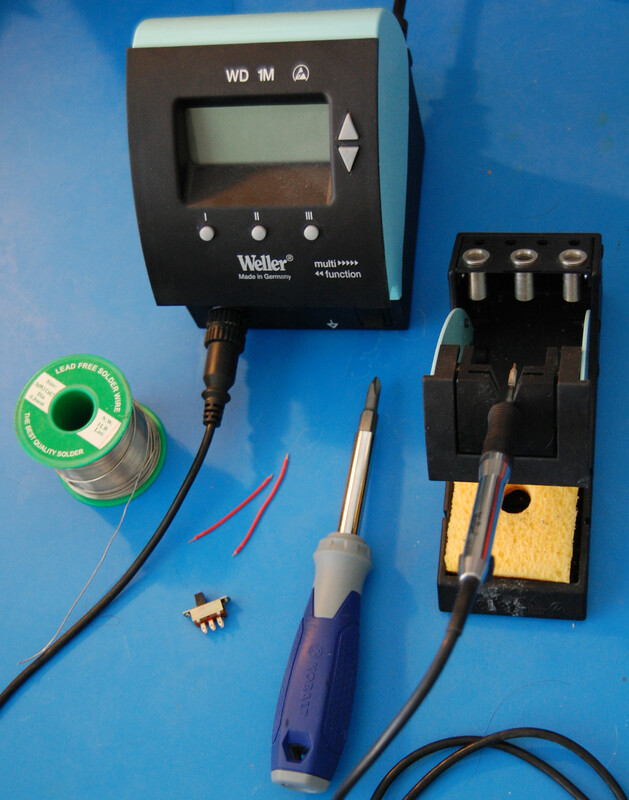 If you don't have some of the tools like a soldering machine, don't languish. Here are some directions that I found online that can reset your mask to 30 uses. I have not tried this, as I don't want to reset the mask every 30 uses. 1. Change the batteries if lights are getting dimmer. 2. Use a screwdriver and open the case. 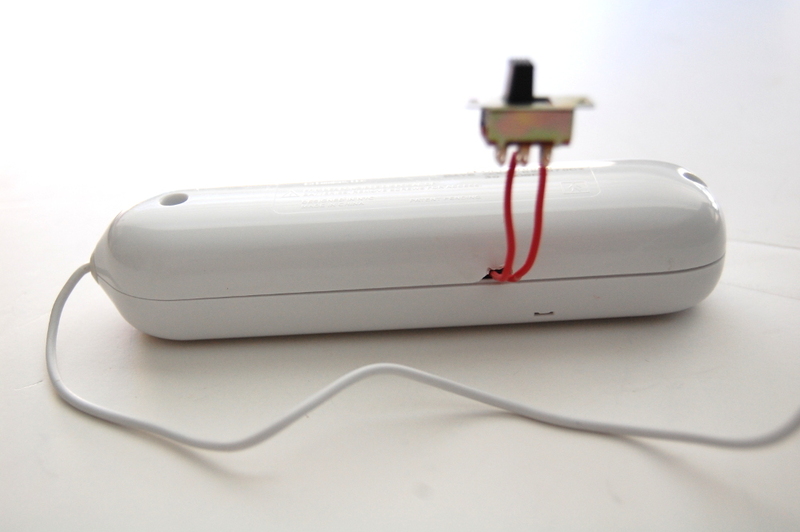 Then remove batteries and unscrew screws so the plastic battery holder on top of the circuit board can be moved over. Be careful NOT to damage any of the delicate wiring. 3. Now that the circuit board is exposed, put the batteries back in their slots. 4. Using a piece of wire (such as a paper clip) touch one end of your wire and place it where the thin copper wire connects to the circuit board (silver spot marked LED). Touch the other end to the little RESET copper circle--located on the left of the circuit board (use the copper circle above the word RESET, not below). 5. Press the start button while the wire is in place. 6. Move your wire from the RESET button to the TEST button. 7. Press the start button again while the wire is in place, and the count should reset to 30! Updated 3/16/2015: Please note that this is a hack to my own personal device for my own personal use. This article is provided for informational purposes only. Lollipuff cannot be held liable for any damages resulting from improper use of this information, as any device modifications may (or may not) void any certifications (eg. FDA or FCC). Use at your own risk.